Often called the $4 dollar list, it typically has a list of the medications currently sold at discount prices. The list will change, take an updated list with you each time you visit the Doctor. Watch the dose, not all strengths of the medications listed will be covered. Popular antidepressants like fluoxetine and citalopram and usually discounted. Common blood pressure medications like lisinopril and HCTZ are usually inexpensive too. Diabetes medications like metformin and glipizide can be purchase at a good price most of the time. No doubt about it Antibiotics save lives, reduce the risk of hospitalization and more. However, the CDC estimates 30% of prescriptions for antibiotics are unnecessary. Checkout their guide to determine antibiotics may be needed for your illness. And, ask you Doctor if they believe you need an antibiotic. If you do require an antibiotic, ask your Healthcare provider if a generic will work for the infection. Antibiotics like amoxicillin, cephalexin and ciprofloxacin are often sold at reasonable prices. Many former prescription medications are become available without a prescription. Medications to treat heartburn and reflux can now be purchased of the shelf. Ask your doctor if they could work for you and if they approve of you using them long term. Many affordable allergy treatment are nonprescription. Fluticasone nasal spray and antihistamine tablets like loratadine and fexofenadine are very reasonably priced. 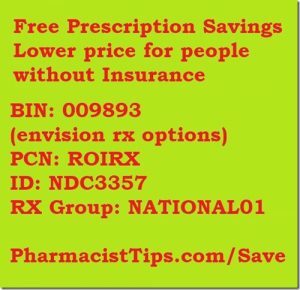 Many medications to treat blood pressure and diabetes have an additional discount when purchased 90 days at a time, some pharmacies even have a 180 day-supply discount. Metformin, Atenolol and Lisinopril are often cheaper when purchased in a large quantity. Combination tablets may save money. Lisinopril with hydrochlorothiazide is half price if you buy as the combination. However, some combination tablets are actually more expensive. Ask your Pharmacist about the most cost effective way to purchase your blood pressure medications. Pill splitting can sometimes save money. Ask your Doctor and Pharmacist to ensure your medication is suitable for cutting. If it is you could potential cutting your prescription costs in half. Checkout the video I made about pill splitting? If your medications are already on a $4 dollar list a discount card isn’t going to do much. However, sometimes discount cards can save money. I offer one here, or just take a screen shot of the information on this page, or I will mail you one. Check prices here. Please do your research and just present the pharmacy with one card. It takes time to type the card information into your pharmacy file and each time the pharmacy transmits a claim to the discount card they are usually charged a fee. Get to know your Pharmacist and ask them if there are ways to save money on your prescriptions.